I'm super excited to share the final PDF of the Grand Amplifier campaign! If you've been yearning to save Kin civilization and become the greatest Explorer Knight in history, this is your chance to get started. I am proud of Amplifier and believe it offers a uniquely grand and compelling adventure while doing as much to evoke the Upwind setting as the corebook itself. Per usual, I will shortly be sending out a link via Kickstarter's message system to all backers who qualify for the GA PDF. Watch for it, download, play and let us know what you think - I would love to hear how your game goes. I am proud of Amplifier and believe it offers a uniquely grand and compelling adventure while doing as much to evoke the Upwind setting as the corebook itself. When a crew of inexperienced Explorer Knights is ordered to hunt down a notorious smuggler and recover what he has stolen, they become unwitting proxies in a mysterious conspiracy. As dangerous missions lead to strange discoveries and stranger allies, the characters face forbidding moral dilemmas and must make the ultimate sacrifice if they are to save Kin civilization. The Prophecy of the Grand Amplifier is a setting-spanning campaign that takes new characters from their time as novices at the Explorers’ Academy through the world-changing events of the Third Incursion. The epic-scale adventure challenges the young knights to become the Guild’s greatest heroes or condemns them to be its darkest villains — the choice is theirs to make. 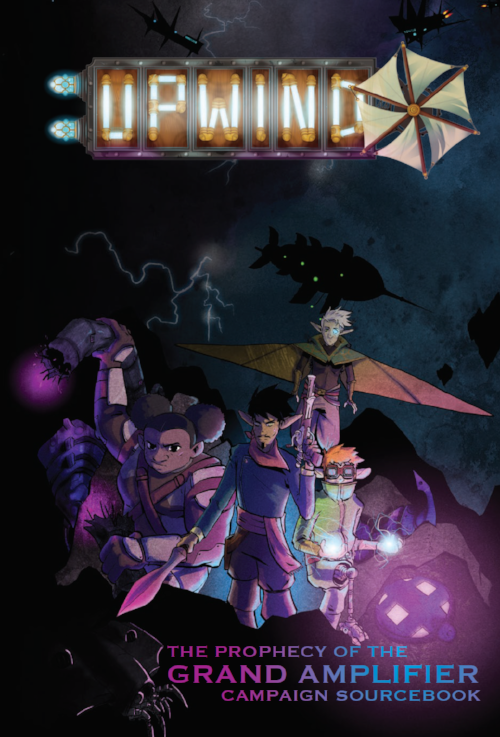 • More than 50 hours of adventure with detailed guidelines for running the campaign and rich, Q-System outcomes for every encounter. • 20 Academy flashbacks with unique, character history-building outcomes. • 18 voyaging encounters, suitable for dropping into any Upwind adventure. • 105 stand-alone descriptions of new NPCs, organizations, locations, Masters’ caches, relics, ships, crews, creatures and dangerous foes.